Amazon surprised developers today with the launch of Snowball, a new physical appliance that will allow AWS users to ship huge amounts of data for import into AWS by shipping the device back and forth between their offices and the AWS data centers. The appliance is a bit larger than an old-school desktop case and it can hold up to 50 terabytes of data. It has a Kindle on the side, which functions as an automatic shipping label. Amazon says the case can withstand a 6 G jolt and is entirely self-contained, with a 110-volt power supply and 10 GB network connection built-in. Every import/export job will cost developers $200. The first 10 days of onsite usage are free, each extra day on site will cost developers $15 days. Amazon won’t charge for importing the data from Snowball into S3, but it will charge $0.03 per GB for export. 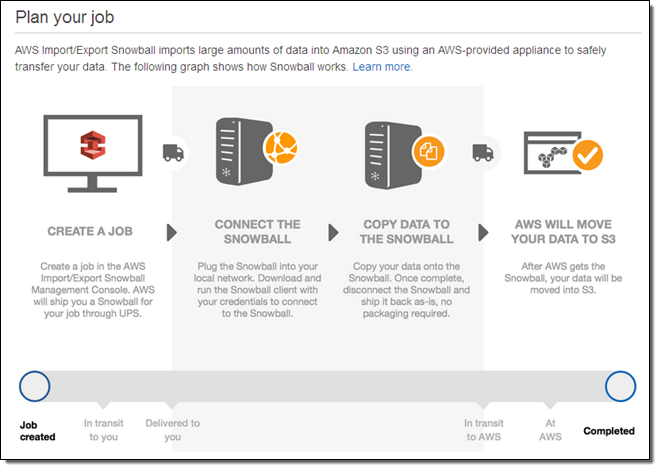 After the user sets up a Snowball job on AWS, Amazon will ship them a Snowball appliance. They then import their data into the appliance and ship it back to Amazon, with the built-in Kindle functioning as the shipping label. For now, all of the data from Snowball appliances will be uploaded into S3 Standard in Amazon’s Oregon data center — support for other data centers is coming soon.